The United States of America's Institute of Peace has identified religious ignorance, grinding poverty, unemployment and illiteracy as reasons why Boko Haram has continued to be successful in recruiting young men into its ranks of deadly foot soldiers and potential suicide bombers. According to the author of the special report, 'Why Do Youth Join Boko Haram', Freedom Onuoha, the on-going insurgency was 'a national, regional and international concern'. 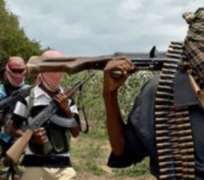 In the 12-page report published in June, Onuoha, who is the Head of the Department of Conflict, Peacekeeping and Humanitarian Studies at the Centre for Strategic Research and Studies of Nigeria's National Defence College in Abuja, stated that the terrorist group had been able to recruit young men because of the little or lack of basic knowledge of what the Qur'an teaches. Touching on the role religion plays their recruitment as Boko Haram members he said, 'Ignorance of religious teaching opposed to violence makes youth more vulnerable and susceptible to recruitment. In all the states surveyed, there is unanimity that initial ignorance of religious teaching is the leading factor influencing the adoption of extreme religious views, especially among youth. According to the author of the commissioned report, young people are very vulnerable to recruitment and radicalisation by independent and roaming preachers, extremist groups, and religious ideologues, who often distort religious injunctions. In a survey quoted in the report, 93.2 per cent of respondents in Borno state were of the view that ignorance of the full teaching of their religion influenced young people's adoption of extreme religious views. In Kano and Sokoto states, 90 per cent and 82 per cent of respondents, respectively, believed that ignorance of the full teaching of their religions is a factor that influences the adoption of extreme religious views by young people in the community.